We take every precaution to ensure that our patients have a successful outcome. Prior to anesthesia, we perform comprehensive physical exams and recommend bloodwork to ensure that the organ systems are functioning well and that they are good surgical candidates. 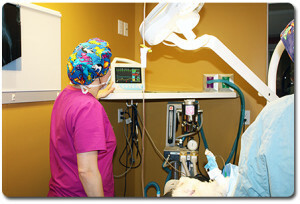 Anesthetic protocols are tailored to each individual patient. During the procedure, intravenous fluids are used to support the cardiac system and our trained veterinary technicians monitor the patient closely with state-of-the-art machines that measure pulse ox, blood pressure, respiratory and heart rates, ECG, and body temperature.